My Very First Blog: I Discovered The Juciest And Most Affordable Steak At Jeffer! I Discovered The Juciest And Most Affordable Steak At Jeffer! During my recent trip to Bangkok, I discovered by accident a restaurant that serves one of the most juiciest and affordable steaks in town! 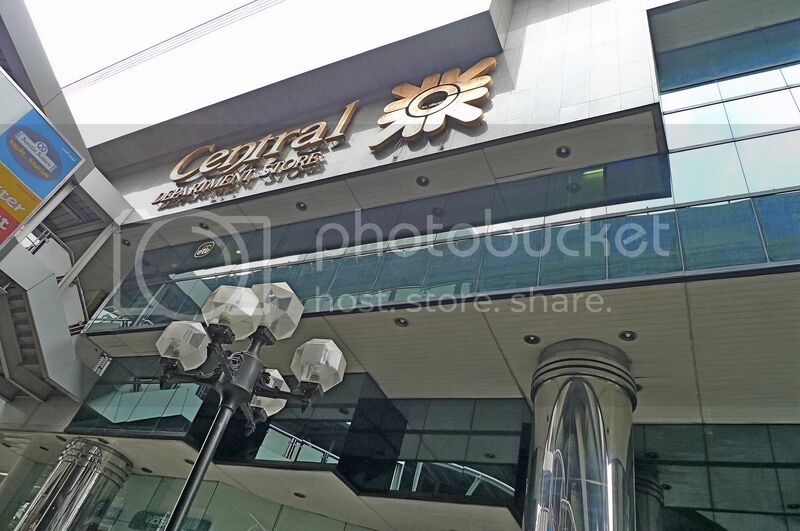 The above photo shows The Central Department Store which is inside the Silom Complex. 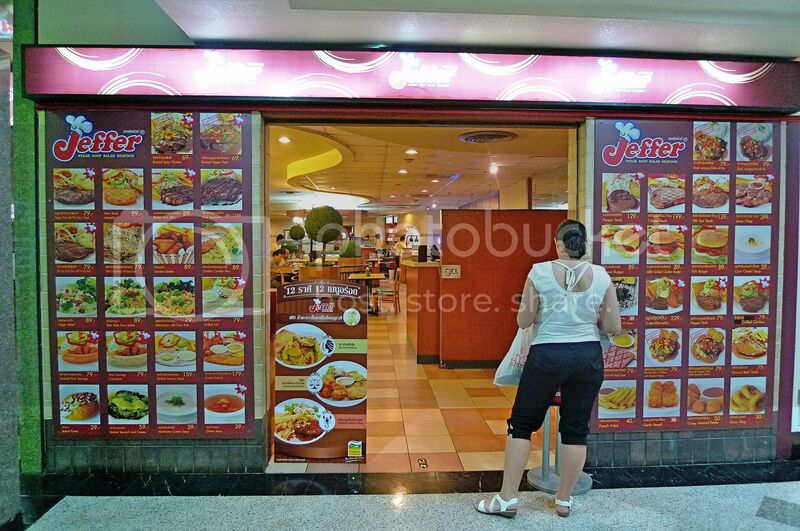 The Jeffer Steak Restaurant is located at the basement floor of the Complex, just below this Central Department Store. My friend and I chanced upon this restaurant while walking around searching for a place to have our dinner. Look at my tall blended pineapple drink! 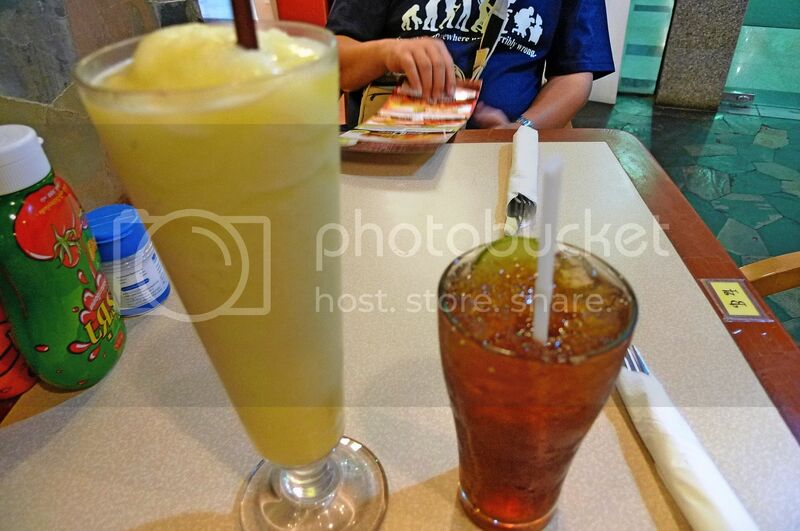 Compare that to my friend's iced lemon tea. The pineapple drink was super delicious! Priced at only 39 baht (RM3.90), it was worth the money! My friend told me his iced lemon tea which costs 30 baht (RM3.00) was really nice and different from the usual iced lemon tea we had in Malaysia. We suspected that they had added in lemongrass to the iced lemon tea to give it that extra oomph! I ordered their Signature Tender Pork + Jeffer's Grilled Chicken set. The set came with fries, salad, and toast. When I first bit into the grilled chicken, I was like Oh My God! This must be the best chicken steak I have ever tasted in my life. It was so tender and juicy! Their signature pork was just as juicy and tender! I was completely floored. And the best part was, the price of this set was only 119 baht (RM11.90)!! 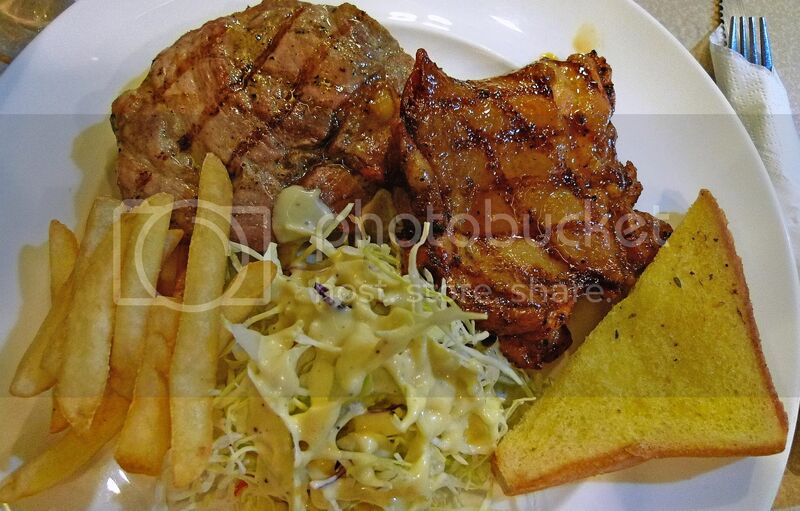 Where can you get such a delicious steak for that kind of price in Malaysia? If I were to start a franchise for Jeffer Steak in KL, I am pretty sure I can get lots of customers even if I price this set at say, RM29.90!! 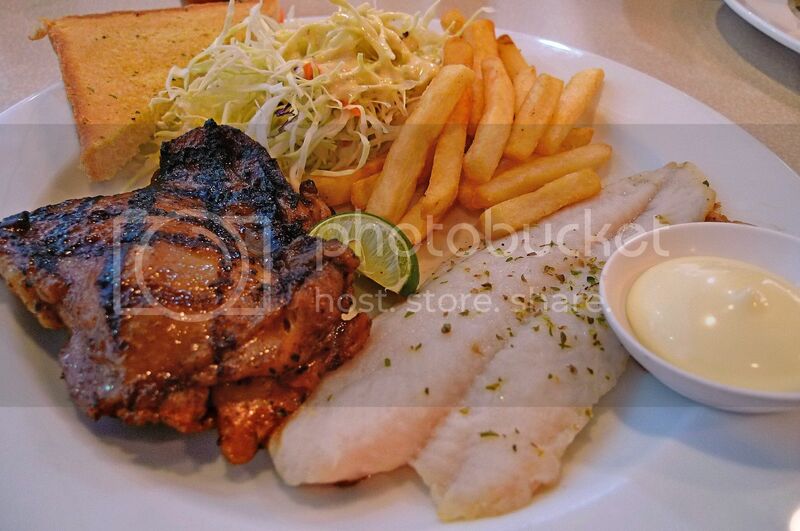 My friend ordered the Jeffer's Grilled Chicken + Grilled Fish set. 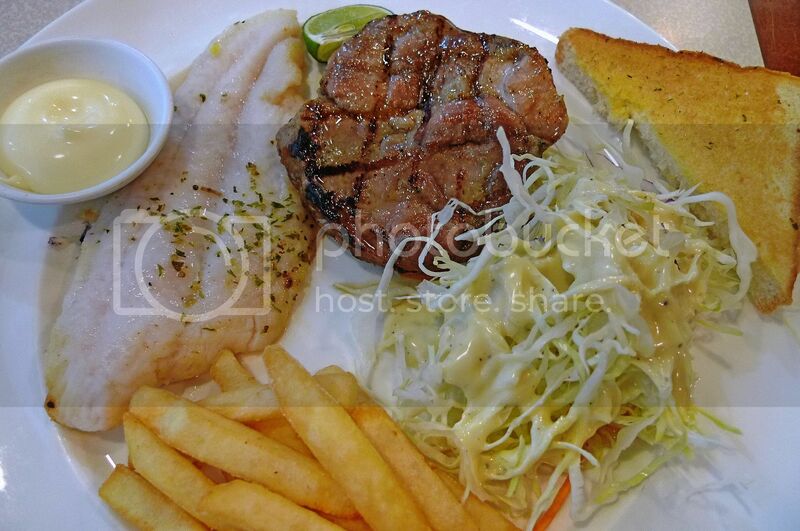 This set was also priced at 119 baht (RM11.90) and also came with fries, salad and toast. According to my friend, it was delicious! Like me, he could not stop raving about the tender, juicy chicken. We were both so impressed with the restaurant we came here again to eat our lunch the next day! 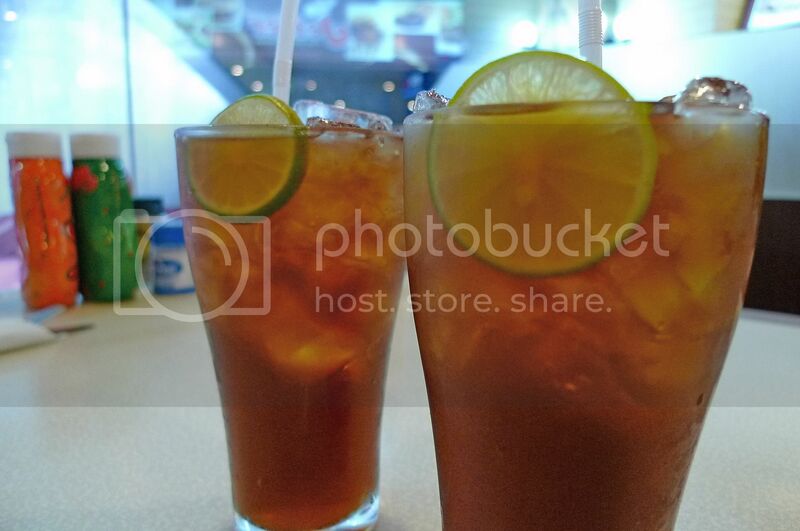 So for lunch, I decided to order the iced lemon tea since my friend had told me it was nice. We both had iced lemon tea. And true to what my friend said, the iced lemon tea indeed tasted much better with lemongrass! This time, I wanted to try the fish that my friend ate the night before so I ordered the same Jeffer's Grilled Chicken + Grilled Fish set that he had ordered. Wow! I love the fish with the sauce they provided. Yummy!! My friend decided to try the Signature Tender Pork + Grilled Fish set. This set was also priced at an unbelivable affordable rate of 119 baht (RM11.90)! My friend loved the pork but he thought that the chicken was the best! I just could not stop raving about this restaurant! The next time I go Bangkok, I will definitely go to Jeffer Steak again for lunch or dinner! oh my their signature pork looks awesome!! mariuca, yes the pineapple drink was really refreshing! And the price is so worth it!! Must eat at Jeffer again!! Wow wow so affordable! and the best part is the food is good. If it's RM29.90 in Malaysia, I don't think I wanna eat it. Food in Malaysia is too expensive. I want that ice blended pineapple drink! For RM3, we can barely get a glass of soft drink in a nice restaurant here. Everything is like... so cheap! That is really very cheap. Bangkok is really a nice place to visit.. cos the food there are so reasonably cheap!! looks so yummy and cheap! uh now i also feel like eating some grilled. It only goes to show that our cost of living is indeed high. Thanks for sharing, Foong. 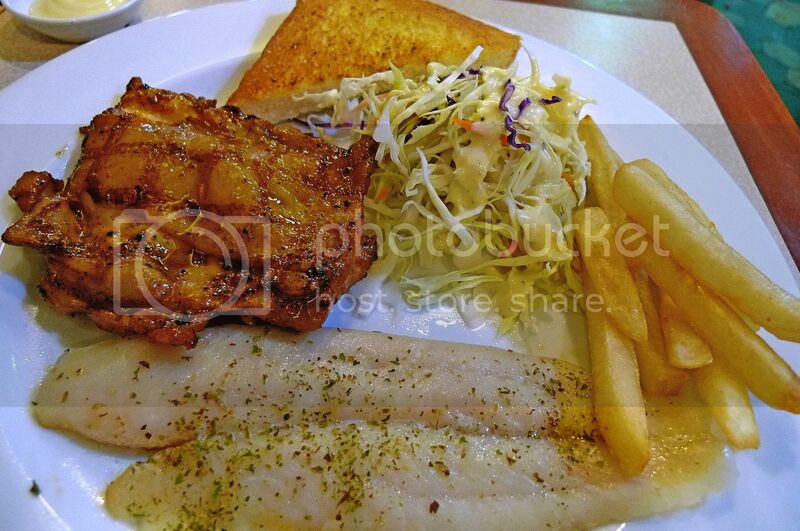 the fish looks so pale to me la!! LOL!! but guess if eat it with the sauce would be great! Yummy! :) I am not a steak person. I still love my pasta more. wow..those steak really look yummy! wow!!! those steaks definitely looks very delicious, and even the look is promisingly juicy already.. Excellent blog. So delicious foods. Keep on sharing please!